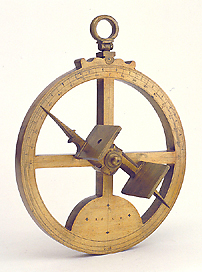 The rim of the astrolabe is graduated on the front, on the top half. The scale is divided to 10, to 5, to 1 and to 1/2 degree, numbered from 5 to 90 by 5 with 0 at the zenith. On the bottom part is the date '1608' engraved on the brass filling and on the rim is the signature 'GOIS'. The alidade is counterchanged and has two conical sights. The back of the instrument is blank. The alidade is fixed by means of a pin and screw. Suspension is by ring and shackle, which fits into a throne simply decorated in a wavy line.